An interest in places of pilgrimage is very much a part of the life of many people in the modern world. For Christians, it is the Holy Land that holds specific interest - the area where the events described in the Bible, in both the Old and the New Testament, are located. 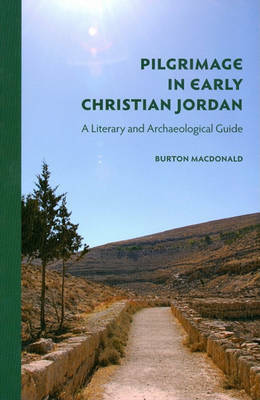 This volume focuses on early Christian pilgrimage in Jordan, the region east of the Jordan River which has so far been little explored by pilgrims and tourists to the Holy Land. Yet many biblical events are said to have taken place here: Moses seeing the Promised Land, the ascension of the prophet Elijah and John the Baptist's ministry and beheading, to name but a few. This book takes an innovative approach to studying these sites. After a general introduction to each site, its biblical significance and a citation of the relevant biblical sources with commentary, the author lists the literary sources that pertain specifically to early Christian pilgrimage activity. This information is complemented with a description of the early Christian archaeological remains found at the site and their interpretation. Illustrated throughout with maps, plans, and photographs and including travel directions as well as suggestions about visits to the sites, this volume is made for scholars, pilgrims and tourists with an interest in early Christian and modern pilgrimage to the Holy Land. Burton MacDonald is Senior Research Professor in the Department of Religious Studies at St. Francis Xavier University in Antigonish, NS, Canada. His special interests are the archaeology of Jordan, especially the southern part of the country, within the framework of the prehistory and history of the Ancient Near East and its connection to Old Testament / Hebrew Bible Studies and the Christian Religion. He has conducted archaeological fieldwork in Jordan since 1977 and has been the director of numerous archaeological surveys throughout the region. His latest survey projects include the Tafila-Busayra Archaeological Survey (19992001), the Ayl to Ras an-Naqb Archaeological Survey (2005-2007; currently under preparation for publication), and the Shammakh to Ayl Archaeological Survey (since 2010).